This is my right side after thought pocket. I am working on the other side as we speak. The decision to make a pocket after the fact was kind of difficult. This pattern has a cable on every other row. It is extremely difficult to just cut and pick up the stitches. 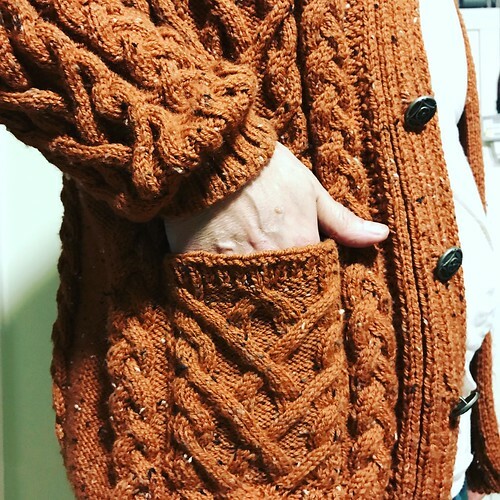 Honestly too difficult for me to think about the fact that I could lose the whole sweater pattern if I make a mistake. I decided to use the same yarn and create a duplicate of the pattern, but in smaller needles. I allowed for 3 stitches on each side of the pattern to be on reverse stockinette, like the pattern. I slipped the first and the last stitch of every right side row. I left a long enough tail to do a duplicate stitch at the bottom. It was a job well done.